A Dessert Fondue Platter is the perfect way to entertain or spend quality time with your love partner or friends. Get ideas and two dessert fondue recipes for a dinner party or date night at home, here. 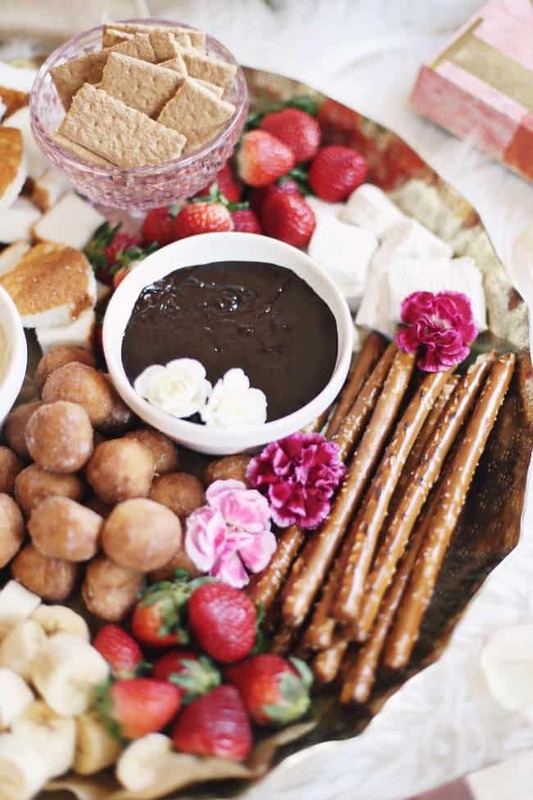 This dessert fondue platter can serve a small crowd for a party or can be a date night at home with a loved one. You should know by now that one of my favorite ways to entertain, whether for a group or for a party of two, is to provide large food platters with lots of options. Serving dessert is no different. Turning a party cheese board into a meal can satisfy so many cravings as can a chocolate & cheese dessert board or this dessert fondue platter. With this food board trend in mind I’ve created a romantic date night at home just in time for Valentine’s Day and beyond. This is the perfect spread for cozying up by the fire, or in front of the tv for a romantic movie night. Of course the more dippers you put out, the more people you can serve, so by all means pull this out for entertaining a crowd as well! If you’re in the fondue mood, you can start your evening with cheese fondue for two as the main course. This date night reminds me of the very first date my husband and I went on. He took me to The Melting Pot and thank goodness we got along, because three courses of fondue over two hours could have been awkward if we hadn’t! Offer two types of fondue – one chocolate (recipe below) and one cheesecake fondue recipe for different flavor options. Use a fondue pot or mini crock pot to keep the fondue warm. In a small sauce pan or fondue pot, heat chocolate chips, cream and caramels over low heat, stirring until chocolate and caramels are melted; about 3-5 minutes. These ideas are just in time for Valentine’s Day but be sure to make time for date night all year round; cheers! what a fun and great way to share the way you all care about each other.